Yes - I organized by color, folks. And while it's unneccesary and more 'Bree Van de Kamp' than I will ever be, for some reason it kind of makes getting dressed more fun. Like I'm shopping for an outfit in Cher's amazing closet from Clueless. Except this is a two foot section of clothes rod, not a revolving department store. But you get the idea. I may have to do a weekly 'check out the status of my closet' feature on the blog to keep it this way, otherwise I give it a week, tops. And yowsa, I have a lot of dress shirts. I blame YOU, Express! Note to self: stop buying pink and white dress shirts. It's so neat and tidy!! I'm not sure what I'm more jealous of... the organization or the selection :). This looks so great. Something I would never have the patience to do it, but it's great. I just organized my closets last weekend, too. 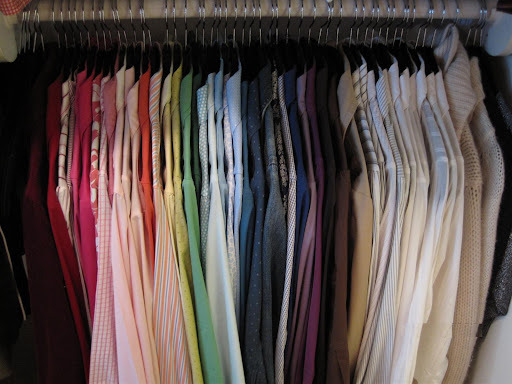 It's so nice to have a neat closet. For the week it lasts. =) Are those the huggable hangers? I have those, too, and love them. Hi! I just followed you from Kim's comment page and I really like your blog - can't wait to see more! Thanks everyone, I love the way it looks and hope it lasts! They are the huggable hangers, aren't those the best invention?? I seriously have to stop buying shirts. Oonafey - so glad you checked me out! I will do the same. 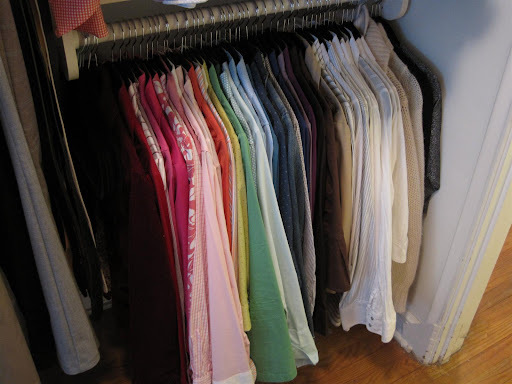 Hey finally someone else who organizes there clothes by colour. I have been doing it for 18 years. It looks like a lot of work but once you do it the first time you know where to put your stuff back. It really takes no effort.